Christmas beckons yet again and another chance at getting the NI assembly up and running has eluded Tony, Bertie and company. Not that it surprises anybody here; the chances of getting Big Ian and Gerry to agree in such a short time was never a starter, but then politicians don’t live in the real world. We are getting used to direct rule again, which means that we elect people who have absolutely no effect on how we are governed and the people who actually govern have absolutely no interest in us. Of course, it will also mean the loss of a government input of £1bn towards to getting our infrastructure up to something like the 20th century (I do mean the 20th) which is not going to please a lot of people; but principles are principles!! Maybe the Christmas Fairy will pull something out of the bag, but I, for one, will not be holding my breath. Another anomaly in this wonderful island of ours is that Cork Institute of Technology in conjunction with the Irish Navy (two fisheries protection vessels and a few auxiliaries (rowing boats)) has just opened the most modern Naval Training College in Europe. I met some of the RN at a joint reception on HMS Belfast and they were absolutely green, which is only fitting. My company fitted out the College, with the exception of the €4m odd spent on simulators of various sorts, so I have spent quite a lot of time in Cork over the past 9 months. “What rubbish he writes”, I hear you say to yourselves, “better he sticks to the day job”; that’s if you’ve actually bothered to read this far! Nothing changed there then. On the family side there have been no great happenings, still only 5 grandchildren the eldest is now 18. 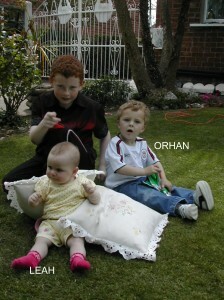 Unfortunately Orhan, now three and at nursery school, took a bout of convulsions and ended up in hospital for a week. Our youngest son, Peter had exactly the same when he was that age, so it seems it may be hereditary. Luckily Peter grew out of it by the time he was five, so we have our fingers crossed that the wee one will be no worse at least. Peter is back at the Tech after a year at University of Ulster. Studying Civil Engineering supposedly. Says he wants to be a quantity surveyor. As far as I can judge the quantities he surveys are our money and the contents of a pint glass!! Maybe he just takes after me! The youngest addition, Leah continues to do well so no problems there, fingers crossed. Socially it has been quite a good year. We went to Benidorm in February. Was not too bad, but would not be a place that I would make any effort to return to. Any town that can tolerate a bar with all the trappings of the UDA, UVF etc painted on the outside walls fails to get my vote. In May I went on a business trip to Chicago, first time in the States, and was suitably impressed. Managed to fit in all the sight seeing bit. We took the caravan down to Kilkenny in the summer for a week; nowhere near as nice as Killarney, but managed to play a bit of golf and walk the dogs between the rain showers. Josephine and our daughter and the grandchildren went up to Ballycastle for the Lammas fair at the end of August and got rained out. They were the lucky ones, only getting wet.Two or three vans lost their awnings and one a door. To recover we went to Lanzarote in September. 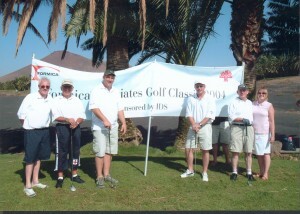 It was an ‘out of the blue’ offer from Formica – them of the plastic table tops – 8 days, 5 star hotel, all expenses paid. 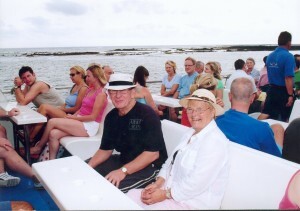 230 of us on the trip with golf, excursions and entertainment all laid on. It really was a great trip and we made new friends. Formica’s next planned convention is to Dubai in September 2005, but the chances of getting on that are slim.Apart from that I have been across to Italy a couple of times with work. It is one of the most relaxing countries I have ever been to and the hospitality is unrivalled. It’s a hard life! Well I think that is a fair summary of our year so it leaves me to hope that yours has been as enjoyable as mine and to wish you all the very best for Christmas and a peaceful and prosperous 2005.